﻿Welcome to the 2017 'Together in the GCC' Project! 'Together in the GCC' is a project designed for grade four students in the GCC countries to learn about their home/host country, as well as to learn about the collaboration between and purpose of the Gulf Cooperation Council. If you are a teacher in the GCC (or know of one), please consider joining our students in this exciting project. Currently we have participants from Bahrain, Oman, Qatar, and Saudi Arabia. We are looking for schools in the UAE and Kuwait, but would be happy to include you if you teach anywhere in the GCC. If interested, please see the Contact page and either fill out the contact form there or email Amy O'meara and Luke Meinen. Project dates are April 23rd - May 31st. Phase 1: Learn about the Gulf Cooperation Council and it’s member countries. 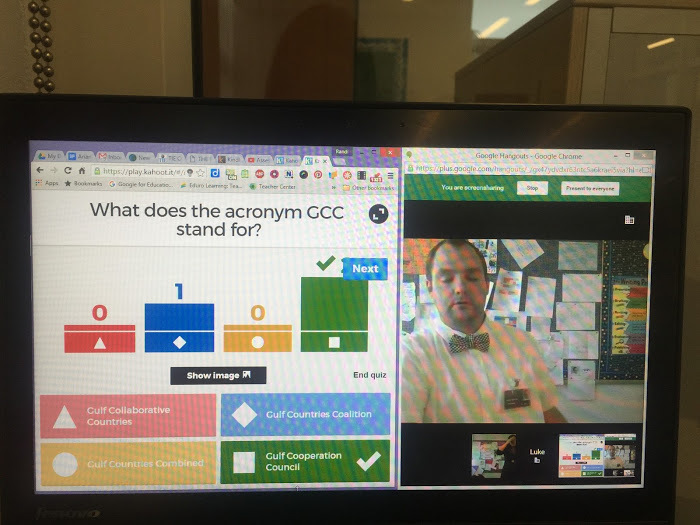 At the end of the research, students will compete in a Kahoot GCC Trivia Game over Google Hangouts. Phase 2: Learn about and present on host country, specifically considering the geographical, cultural, industrial, historical, and environmental interests within the major cities. At the end of Phase 2 students will post their presentations for the other schools to view and learn about the other member countries. Students will provide each other with feedback on presentations, as well as use the information to inform their decision about which 10 cities they should choose for their GCC train route. Phase 3: Use the information gathered in Phase 2 to create a Google: My Map of chosen locations for the GCC train route. Teams will also create a screen cast to present their train route, along with evidence that supports their choices. Ideally we would have students in groups from different schools to give students the chance to collaborate, much like the teachers have been throughout the project (this decision will be made by participating teachers closer to the start of Phase 3). At the end of Phase 3, students will post their presentations and comment on their peers’ projects. Students and Teachers will choose the top presentations to be part of the final Together in the GCC video we share with our school communities and possibly news agencies in the GCC countries. 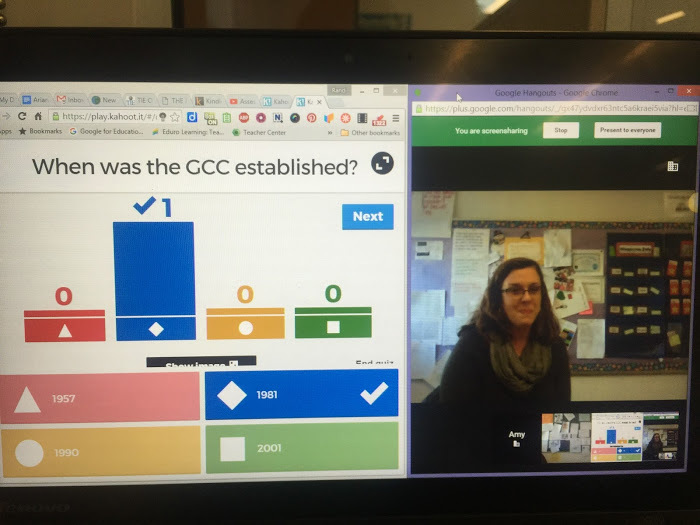 Phase 1 was a great success and it was obvious the students enjoyed showing off their GCC knowledge using Kahoot over Google Hangouts. In the following two weeks the teams will finish up their home country brochures and will post recorded presentations to their blogs in order to receive feedback from their GCC peers. We will continue to link the blog addresses on the Phase 2 page, as well as a lesson plan to ensure helpful and kind feedback on the students' presentations. Students and teachers have been working hard to learn all about the Gulf Cooperation Council. Although some might consider the topic interesting, most are studying hard in order to compete in a friendly game of GCC Trivia. We plan on using Kahoot and Google Hangouts to host the game and be able to see our new friends while we are playing. Teachers behind the scenes have been making sure the technology will work for the big game! Together in the GCC 2016 is Coming Up! Please have a look around at the changes we have made to the project this year. We are excited to add more collaborative elements including weekly Google Hangouts, classroom trivia face-offs, and a culminating project where students will be collaborating with others beyond their classroom. We are still seeking participants from the UAE and Kuwait, although if your classroom would like to join us from Saudi Arabia, Oman, Qatar, or Bahrain - we'd love to include you! If you have questions and are interested in the project, please join the participating educators on the Together in the GCC Google Community Page. ​Although not confirmed, we are looking at a start date at the end of January, 2016. The project will run for 5 weeks. Thank you so much for stopping by to check out the project! Hopefully you and your students are interested in joining us to learn more about our GCC neighbors. We are in the process of changing some key elements to the project and would love your input. We have created a Google Community to share ideas and discuss the project elements and time frame. Please join us there using this link.